Synagogue musician; born in London in 1809; died there Sept. 11, 1876; second son of the Rev. Simon Leo. He was a musician and composer of much ability, and was the first to arrange the various Hebrew chants and melodies for part-singing (1838), which eventually replaced the old "bass-and-singer" style. Leo wrote the music for the inaugural service of the New Synagogue, and for the reconsecration of the Western Synagogue in 1836. 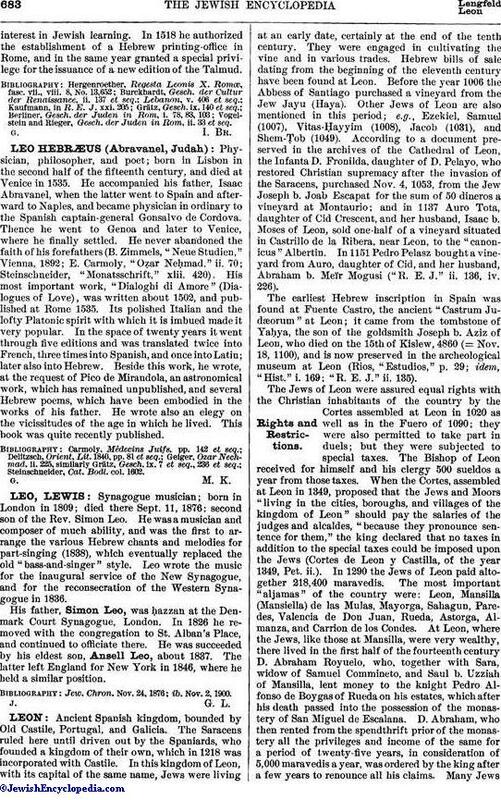 His father, Simon Leo, was ḥazzan at the Denmark Court Synagogue, London. In 1826 he removed with the congregation to St. Alban's Place, and continued to officiate there. He was succeeded by his eldest son, Ansell Leo, about 1837. The latter left England for New York in 1846, where he held a similar position.